The second book in the #1 New York Times bestselling Maze Runner series that is soon to be a motion picture, hitting theaters September 18, 2015, and is perfect for fans of The Hunger Games and Divergent. The first book, The Maze Runner, is now a movie featuring the star of MTV's Teen Wolf, Dylan O'Brien; Kaya Scodelario; Aml Ameen; Will Poulter; and Thomas Brodie-Sangster! Also look for James Dashner's newest novels, The Eye of Minds and The Rule of Thoughts, the first two books in the Mortality Doctrine series. Solving the Maze was supposed to be the end. Thomas was sure that escape from the Maze would mean freedom for him and the Gladers. But WICKED isn't done yet. Phase Two has just begun. The Scorch. There are no rules. There is no help. You either make it or you die. 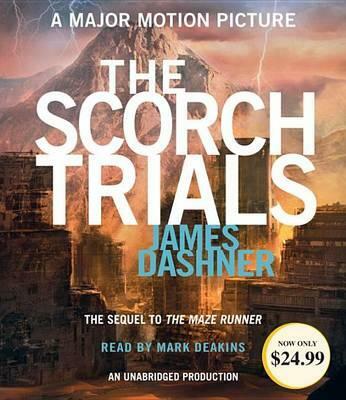 The Gladers have two weeks to cross through the Scorch--the most burned-out section of the world. And WICKED has made sure to adjust the variables and stack the odds against them. Friendships will be tested. Loyalties will be broken. All bets are off. There are others now. Their survival depends on the Gladers' destruction--and they're determined to survive. James Dashner is the author of the #1 New York Times bestselling Maze Runner series: The Maze Runner, The Scorch Trials, The Death Cure, The Kill Order and The Fever Code, as well as the bestselling Mortality Doctrine series: The Eye of Minds, The Rule of Thoughts, and The Game of Lives. Dashner was born and raised in Georgia, but now lives and writes in the Rocky Mountains. To learn more about him and his books, visit JamesDashner.com, follow @jamesdashner on Twitter, and find dashnerjames on Instagram.